Manufacturer of a wide range of products which include heating coils, fiberglass heating tape, ceramic filters, round ceramic pressed filter, ceramic uv press filter and heater tube. We are highly specialized firm offering wide gamut of finest quality Heating Coils. 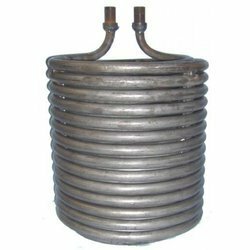 Owing to their high efficiency and endurance, these are widely used in industries as induction coils for any type of furnace. 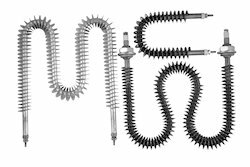 Offered in different configurations, these are manufactured by using high quality materials with use of cutting edge technology while considering clients diversified needs. Furthermore, these products are available to customers in affordable price range. 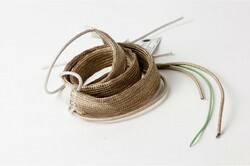 Helical heating coil insulated with fiberglass sleeve & tape suitable for max 150c. Skin temperature. It will have terminal leads with the ceramic connector at either end. To heat viscous fluids by wrapping it around pipe, flasks, breakers etc. Anti-condensation applications in the motor, generator sets etc. We are listed among the leading manufacturers and suppliers of Ceramic Filters in the countrywide market. 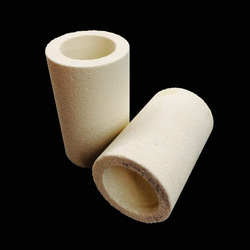 The filters we deal in are manufactured using high-grade ceramic and refractory material in exact adherence to the defined industry standards and norms. The demand for consistent quality castings with lowest levels of inclusions have made conventional gating systems filter dependent. The variety and abundance of foundry filter types are making choice difficult for foundries. Most of these foundry filters are efficient and effective in keeping dirt away, but are quite expensive. Manufactured from premium quality ceramic and refractory materials, these ceramic foundry filters have good resistance to abrasion and erosion. 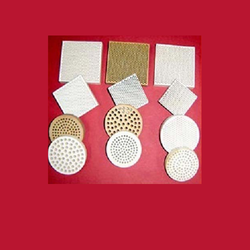 Our filters are perforated ceramic filters for use in grey, ductile and SG iron casting applications. These ceramic filters efficiently remove slag dross & other non-metallic inclusions from molten iron. Our Filters are used globally with high profile customer based. With our vast experience in the industry, we have been able to bring forth a wide range of Ceramics Products. These ceramic products are manufactured using high-grade machines and latest methodologies at or production unit. The offered range of products is manufactured by our experienced professionals using optimum-grade raw materials, which is procured from the reliable vendors of the markets. We are one of the leading organization engaged in offering a diverse range of ceramic press filter for ceramic industry. The diverse range is checked on well defined quality parameters. These ceramic filters are manufactured by our professionals in complete compliance with the industry laid standards & norms. The offered range of ceramic filters is widely appreciated among our patrons for their effectiveness and resistance to abrasion & erosion. Owing to our expertise, we have been able to offer our clients excellent quality Heater. This heater is manufactured using high grade raw material and cutting-edge technology as per the set industry standards. The offered heater undergoes various quality tests to ensure the product is free from any manufacturing defects. Besides, clients can avail this heater at market leading prices. Looking for Heater Spare ?